If you are a fan of the Beatles, then you will definitely want to pick up the graphic novel, Baby’s In Black. Through black and white drawings, Arne Bellstorf tells the story of the “Lost Beatle” Stuart Sutcliffe. Sutcliffe was the original bass player for The Beatles when they were starting out, playing seedy clubs in Germany in 1960. Sutcliffe is a fascinating part of The Beatles history, as he was also an accomplished artist and writer who chose to leave The Bealtes right before they made it big. While playing with The Beatles in a dive bar in Germany, Sutcliffe met Astrid Kirchhherr, a local photographer. Astrid also plays an important role in The Beatles history: she shot some of the most famous early portraits of The Beatles when they were in Germany, and are also some of the only photos that include Sutcliffe in the mix. Shortly after meeting, Stuart and Astrid fell in love. It was then that Sutcliffe decided that The Beatles were not for him. He wanted to stay in Germany with Astrid and focus on his painting. Tragically, though, Sutcliffe’s life was cut short when he died from a brain hemorrhage in 1962. He never had the chance to marry Astrid or to see how successful The Beatles would become. This first example is of Astrid and her boss looking artwork and talking about light and expression in classic art. It’s really cool how the art is depicted here, and how they are talking about the expression and lighting which is exactly what comes through in the art of Baby’s in Black. In this second photograph, Bellstorf recreates Astrid’s famous photos of The Beatles. This book is a cool step-by-step guide to creating, publishing and marketing comic books. This is not a how to draw book. So, You Want to Be A Comic Book Artist? guides readers through the entire comic creation process . It gives great tips on developing awesome characters, how to adapt story lines for video games or movies, and ends with how to submit your comic to a publisher. The last two chapters are filled with recommended books, magazines, lists of art schools, and great comic related websites that make this book a must for comic creators. Whether you are a beginner, an advanced comic artist or somewhere in between, you will find something worthwhile in this book. Jane was in the heart of Metro City when there was a terrorist attack. Lucky to survive, Jane’s parents move to the suburbs for a more “safe” place to live. In a new town and a new high school, Jane is not only alone, she is also bored by suburban life. So, on her first day of school, Jane is surprised to find three other Janes who are all friends and eat lunch together. Jane asks to join them and instantly finds friendship. Each of the Janes has their own unique personalities and together they all just fit. To fight the boredom of suburban life Jane rallies the other Janes to form P.L.A.I.N., or People Loving Art in Neighborhoods. They create art installations all over their suburban town to challenge people’s everyday notions of what art can be. Some residents like the art, however, there are those who are outraged and frightened of it and start calling the installations “art attacks”. What does this mean for the Janes? Do they continue their installations, risking arrest? Or worse? The Plain Janes is a great graphic novel for anyone who is interested in art and how it can challenge our everyday beliefs or thoughts. It is also a good read for anyone who has felt like an outcast. It really shows how you can take the things that make you unique, and instead of being negative about them, you embrace them and try and challenge people with your ideas. A lot can happen in one night. On the night of their high school graduation Lucy, Ed, and Leo set out on a night of adventure with their friends. 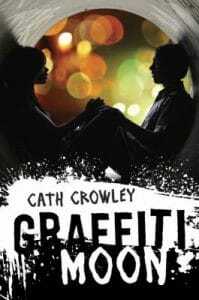 Lucy and her friends Jazz and Daisy want to spend the whole night in search of Shadow and Poet, a couple of graffiti artists that are making their mark in their Australian city. Lucy, who spends her free time as an apprentice to a glass blower, is obsessed with Shadow’s artwork and knows that he is the guy for her. All she has to do is find him, which she has been trying to do for months now. Her friends Jazz and Daisy assure Lucy that before the night is over they will find Shadow. Ed and Leo are Shadow and Poet, but no one knows this. Only their good mate Dylan knows their secret identities. The three guys are in a bad place, though. Ed has dropped out of school because of his dyslexia, lost his job, and his girlfriend. Leo is in debt to a thug for $500 and is also dealing with a hard breakup. Dylan is having problems with his girlfriend Daisy, who he is sure is about to dump him. To try and fix things with Daisy, Dylan tells the girls that he knows Shadow and Poet. The girls recruit Dylan, and his two friends Ed and Leo to help them track down the artists. The guys lead the girls through the city on a search that cannot succeed. Along the way, Ed and Lucy grow closer, even though they are convinced they hate each other after a bad date. Leo and Jazz decide they were meant to be with each other, and Daisy and Dylan continue their fight. However, with such a big secret can Ed and Lucy and Leo and Jazz really find love this night? Also, what will the guys do when it gets to be 2 a.m. and they have to take part in a robbery to fix Leo’s debt? Graffiti Moon is told in alternating chapters in the voices of Lucy, Ed, and Leo. Each voice is so distinct and you really get to know these characters. This is definitely a character driven novel. It’s also great that this whole story unfolds in just one night. There is adventure, comedy, romance, and art all rolled up into one novel. This is a great read for anyone looking for a fun, fast paced read that has a little bit of everything.